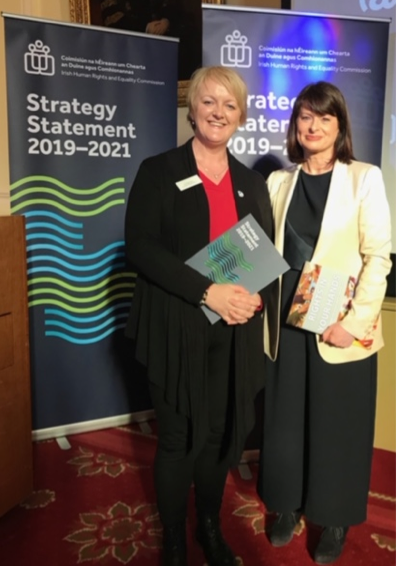 The incoming IFUT President, Dr Angela Flynn, attended the launch of the new strategic plan (2019-2021) for the Irish Human Rights and Equality Commission (IHREC). IFUT was invited to attend this launch alongside a wide range of other public sector and civil society organisations. The four key strategic priorities were presented and their respective objectives and outcomes. Of particular relevance to IFUT and our members is the responsibility of all public sector bodies to demonstrate compliance with the Public Sector Equality and Human Rights Duty. All public bodies in Ireland have a responsibility to promote equality, prevent discrimination, and protect the human rights of their employees, customers, service users and everyone affected by their policies and plans. This is a legal obligation, called the Public Sector Equality and Human Rights Duty, and it originated in Section 42 of the founding legislation, the Irish Human Rights and Equality Act 2014. Dr Flynn has a particular interest in issues of Equality and Human Rights and she recently graduated with a Professional Diploma in Human Rights and Equality at the Institute of Public Administration, having been supported by a Bursary from IHREC. She is an active member of IFUT’s Equality Committee and Gender Equality Committee.